Last month saw the musical joining of two sonically kindred spirits, The Humminbird and Bowl of Dust & Co. The fruit of that union is Noble Creatures, a remarkably challenging and rewarding tape released on Dowager Records. In his 1956 poem "America," Allen Ginsberg confessed to having "mystical visions and cosmic vibrations." On Noble Creatures, we find Kyle Klipowicz and Muyassar Kurdi celebrating those same afflictions, 56 years later. However, rather than aim that sentiment politically, these two Chicago musicians have chosen a spiritual reveal that examines more that state of being and less its political and sociological context. The record opens in soft ceremony, with the sacramental tinkering of a singing bowl and inquisitive clarinet noodling. The track, "Now," builds energy with its chanted, titular mantra, before dissolving into a rippling, synthesized froth that feels startlingly mechanical and foreign. From that dissonance springs "Lap of a Savior," whose ambling string melody carries Klipowicz's familiar drawl. Kurdi's voice sails behind; a spectral and seductive wave that floats through the tune. Though a remarkably simple song, it stands as clear evidence of what these two singers are capable of when playing off of one another. For all the esoteric and charmingly organic instrumentation, the genius of Noble Creatures lies in the moments when the singer's voices dance- at once in relaxed harmony and convulsing discourse. Very much in play on the tape is the dichotomy between real time and imagined time. "Run Away," whose crumpling, foil drone is a bit difficult to digest, seems to expand well beyond its minute and sixteen second hum. The piece serves as the logical end of the duo's more experimental leanings, and sets the stage perfectly for the following number, "Mooncasting." Kurdi moves that song with her trademark rolling zither and phantasmal calls, but allows time for them to be adorned with shakers and chimes and some more subtly jazzy clarinet work. A sense of urgency grows throughout, eventual taking the song from the ease of a prayer into something more carnal. As Kurdi's voice climaxes and falls for the last time, around the eight and a half minute mark, the listener is snapped back into standard consciousness. Similar to what I imagine temporal displacement might feel like, it seems impossible that nearly ten minutes have past since "Mooncasting" began its sensual lull. 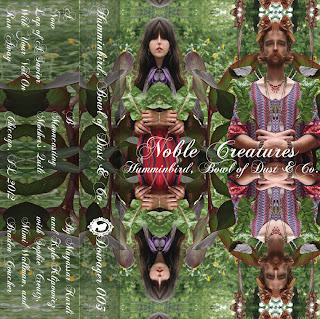 On Noble Creatures, The Humminbird and Bowl of Dust & Co. have crafted a hypnotically alluring record that coasts on duality. It seems a direct response to living in the hurried metropolis that is Chicago, while doing its best to pull at sounds completely foreign to that landscape. It highlights meditative moments of peace with incongruous noise and experimentation. Above all, Noble Creatures brings together two like-minded artists, who force themselves into some of their most gratifying and thought-provoking work. I ruminated on this record for a few weeks, turning it over, immersing myself in it for a day or two and then abandoning it for several more. With each listen I understood more of its personality, more of its message. More than I can recommend listening to this tape, I have to suggest you purchase a copy and visit with it. Each encounter reveals another fold, another angle, another plateau of imagination. After a few sessions, you too will be teeming with your own mystical visions and cosmic vibrations. 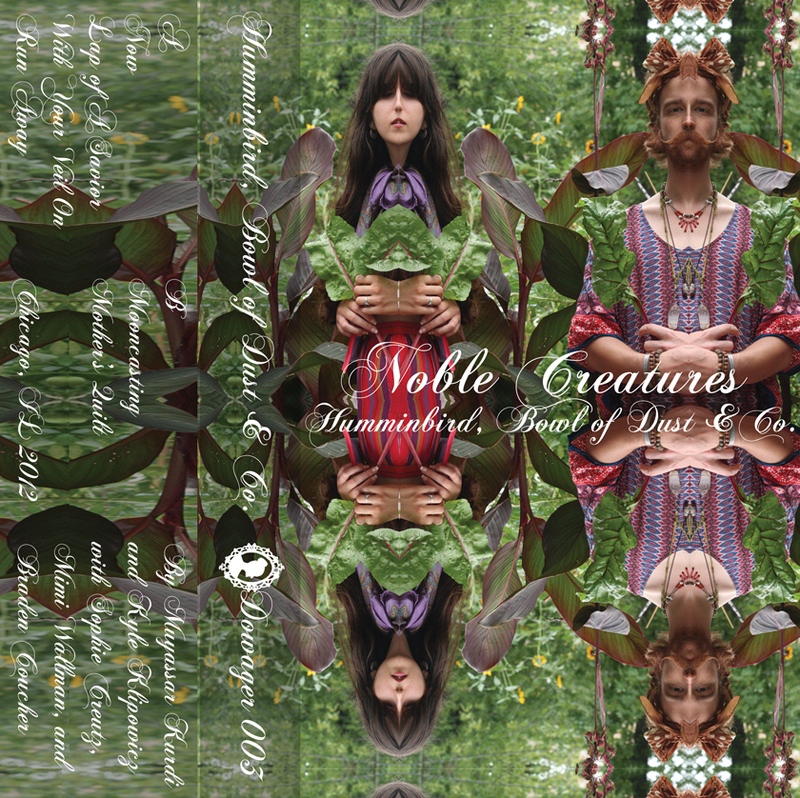 'Nobe Creatures' is available for purchase digitally and on tape at Dowager Records. You can see The Humminbird and Bowl of Dust & Co. live with local heavyweights ONO at The Hungry Brain on Monday, October 22nd ($5 donation, 9pm, 21+). Check out "Mooncasting" below. Mooncasting by Humminbird, Bowl of Dust & Co.
Finding the right venue doesn't have to be time consuming, so visit different establishments until you find a perfect venue for your event requirements.